Maybe you are looking at a pre-existing home to purchase. You consider room flow, price, location, age and condition. Does the house check off most of your boxes? Can you see yourself living here? Does its traditional charm appeal to you? Perhaps you are entertaining the notion of designing a home from the ground up. You look at land. Does it get southern exposure? How far is your commute? Would it be tricky to get materials and large-scale machinery here for construction?Might this location support a more bold, modern approach to home design? In either scenario, an often-overlooked issue remains vital to the safety and protection of any structure, the property slope. 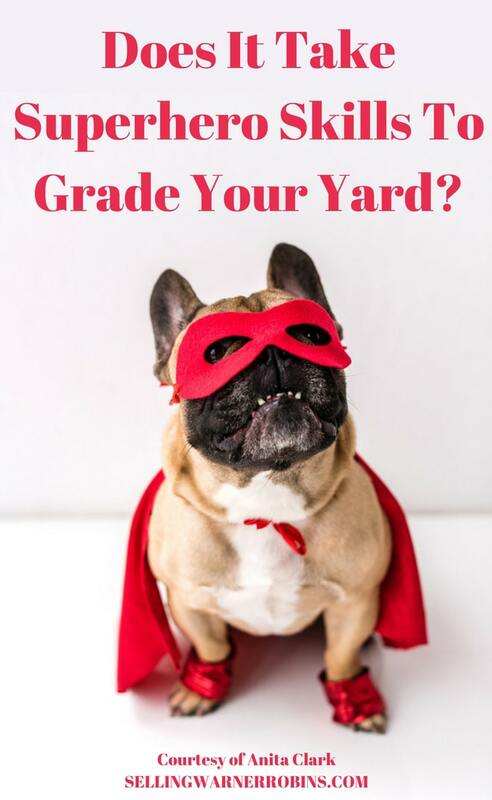 Special care should be taken when you grade your yard to ensure you get it right. But, what is right? The details below will help you understand the effects a poorly graded yard can have on your home and how you can resolve the issue. Of course, avoiding the problem altogether by knowing what to look for upfront can save you a lot of time and money down the road. You can hang state-of-the-art gutters, put in a french drain, and purchase a sump pump with every imaginable updated feature, but if your home sits on land that slopes upward from its foundation, efficient protection against water damage can be as futile as trying to carry grains of rice in a bucket with holes in it. The key is to ensure your home, or the property you are considering purchasing, has grading that slopes away from the home’s foundation. A good rule of thumb is a drop of 2 to 3 inches per every 10 feet with a drop of 6 inches in the first 10 feet. If the grading slopes toward the home, you may need to call in a professional to determine how much work is involved to change the slope grade away from the property. Water flows downward in the direction of least resistance. When a blockage of some sort forms a barrier, water pools and builds up pressure. Mounting water pressure against the foundation of a home has the power to offset its structural balance and significantly compromise overall durability. This can be a significant issue that can cause thousands of dollars in damage. Often times you see foundation settling (heave), standing water under the home (most noticeable if you have a crawl space), and both seepage and flooding in basements. Other tell-tale signs include foundation wall deterioration, cracks in walls/floors, and musty or moldy conditions. How can you tell if a pre-existing home has sustained water damage? Start with a sight-line evaluation. Examine exterior walls. They should appear straight from top to bottom and left to right. If you note a bulge towards the center or curvature of any kind, it may indicate the house has shifted. Next, move in closer and check out the consistency of foundation concrete. Are there spots where you see flaking? If so, probe the area thoroughly with a sturdy tool. If the surrounding material is soft enough to chip off, its damaged. Before heading indoors, glance up at the chimney. Like the structure’s exterior walls, a definite lean indicates a probable structural imbalance. Interior examples of point include basement posts that do not stand at a strict 90-degree angle and visibly bowed crawl spaces. Roll a marble along floors to check if they sag. Make sure to repeat the marble test on porch slats and stoops as well. Finally, check the home’s windows and doors. Do they open smoothly without catching? Can they be latch-closed? Do you note intricate web-like cracks along doorway seams? What about in corners where walls intersect? All of these concerns are indicators your home has endured water damage at some point. Any structure that exhibits signs of sustained water damage is open to two additional structural threats that double as marked health concerns. When water-soaked plaster, woodwork, carpet and upholstery remain damp over time, the perfect environment for mold is born. Once mold spores form, they multiply rapidly and spread. Be alert for symptoms of sneezing, labored breathing, and upper respiratory congestion. This is especially true if you or your family members suffer markedly in a particular location of the house. Mold can be both difficult and expensive to remove. Wet plaster and woodwork should be pulled up, and more often than not, replaced. Soaked carpeting and upholstered furniture may be salvageable if damage is not too invasive. Try scrub cleaning with mold barrier products and an anti-fungal agent such as vinegar. Another health threat a compromised home barrier gives rise to is pest infestation. Insects and rodents enter structures through even the most minute gaps and cracks in search of food, water, and shelter. A mouse, for instance, can easily squeeze through an opening of 1/4 of an inch wide, and ants only require slits that are 1/32 of an inch wide. Pests carry disease. When they burrow into common home materials and reproduce, removal becomes exponentially challenging. Traditional pest extermination methods employ the use of toxic chemicals that include known and probable carcinogens. A much safer option is to securely store food, keep your home environment humidity-free, and remove piles of papers and stored clothing which may harbor nests. Water damage to a home structure compromises its durability, allows for the possibility of mold and pest infestation and, in effect, breaks the air-tight seal necessary for efficient use of energy resources. Heat, like water, follows a predictable path; it rises up from down and rushes towards cold. For example, a well-heated room in winter that nevertheless has a slight crack in the glass of a windowpane will quickly chill as heat escapes through the narrow opening towards cold outdoor air. Just a quarter-inch gap around doors and windows that sit crookedly enable the same exchange of indoor/outdoor air flow as a six-inch square hole in an exterior wall. Floor, wall, and attic insulation reposition along with structural shift, resulting in unprotected spots and uneven coverage. Pipes and ductwork hold similar liability, often succumbing to pressure by bending such that flow is blocked or breaking off entirely. Mitigating factors which eliminate the potential for water damage is a top priority whether you are shopping for a pre-existing home or property on which to design your own. Yard grading is a construction or landscaping technique that modifies a piece of property’s directional slope. A pre-existing home that sits on land that slopes downward towards its foundation stands on the front line of attack for destruction after heavy rains, storms and marked snow melting. Changing the grade to slope downward and away from its base effectively eliminates such risk. Clear all landscaping within a five-foot swath around the home’s perimeter. Ball tree and shrub roots lightly and cover with burlap. Try to roll grass up in equidistant strips and be similarly mindful of root systems. Gather stakes, string and a tape measure. Place one stake in the ground at the base of the house, another straight out at the end of your five-foot cleared area. Run a line from one stake to the other. Raise the string that’s flush against the foundation two to three inches higher than the one five feet out. This is the grade you ideally want to achieve — a six-inch decline every ten feet running downward, away from the house. Fill the space under your strings with clean dirt packed tightly. Add topsoil and use a vibratory compactor to smooth out grade. Recover grass rolls, landscape trees and shrubbery. Re-plant and water thoroughly. Gently check root systems after two to three weeks to make sure they’re entrenched in the new soil. While your landscape supplies and gardening materials are out, help maintain your newly graded yard by leveling out uneven areas in the rest of the lawn. Humps or bulging areas succumb to marked ground erosion over time. Peel back strips of grass in rolls as before. Dig soil down to a common level. Replant grass coils and water well. Low-lying spots or lawn dips result in post-storm mud and stagnant pools of water. Alleviate this scenario the same way you secured away-from-the-house slope. Roll back grass covering. Fill dips up with clean soil and use compactor to tamp down securely. Replant grass, watering the root systems liberally. One final method some homeowners choose to employ is to dig a dry creek straight up the middle of their land and fill it in with river stones. Such an absorbent bed-like feature draws runoff deep down into the earth, keeping above-ground outbuildings dry. 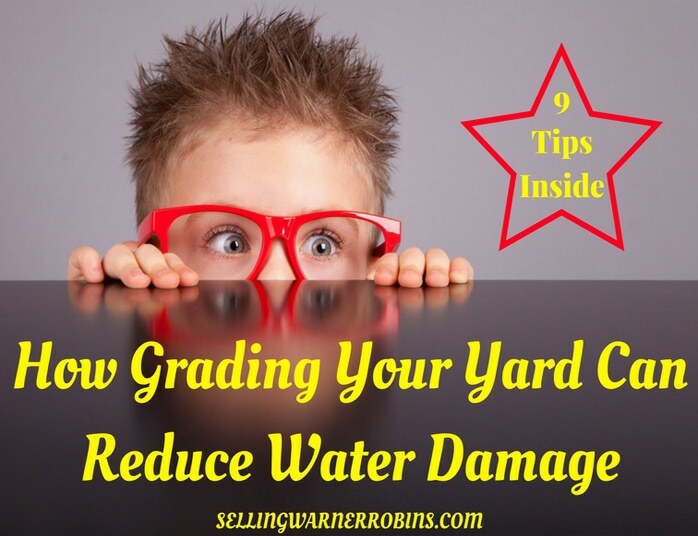 While yard grading is an entirely efficient way to reduce the probability of structural water damage, the activity itself is not without drawbacks. Any time the earth is razed, local flora and fauna growth and reproduction patterns are disrupted so understand this before you decide to raze your yard to fix your drainage issues. Landscaping machines burn fossil fuel, releasing harmful off-gasses into our atmosphere. To protect an already existing house, however, yard grading is just about the only viable choice. For those who are environmentally sensitive, it can be a tough choice, but in the end protecting your home and family from water damage and the effects of that damage to the foundation of your home should win out. Draw home plans with structure on highest ground point. Extend drain lines from sump pump to downspouts at least 20 feet from the house’s foundation. Purchase a battery-operated backup pressure pump for the sump. Leave at least six inches between the home’s perimeter and landscape plantings. Choose and install a gutter system that is easy to maintain consistently. Place river rocks around downspouts, so runoff doesn’t create sinkholes. Build up natural water barriers with hearty grasses like Bermuda and Beach. Institute a rainwater recycling system to catch and reuse rainfall. Design a steeply pitched roof or look into the possibility of cool roof partitions. Arrange windows and doors to create cross-current ventilation. Consider a central dehumidifying system. Purchase area rugs made from natural fibers that are washable. Choose furnishings made of moisture-repellant materials like bamboo. Seal air ducts thoroughly, paying close attention to adjoining seams. Wonderful details, Anita! This is a common problem we face here in Charlotte as well. Thanks for putting this great information together – I will share it on our FB page for our readers too. Much appreciated, as always. Thanks a bunch Debe.